One of my favorite examples of a training client using the Emergency Recall was when her tiny Dachshund mix was on an off-leash hike with her and a coyote appeared about 50 feet away from him (and about 100 feet away from her) along the tree line. Her dog, being who he is and in all his 7 lb. glory, thought he would definitely be able to take on this coyote and started to bark and charge. She called out his emergency recall cue and he immediately turned and ran back to her, away from the coyote. And this was only a few weeks after she'd started training this behavior! What's the Difference Between a Regular Recall and an Emergency Recall? I like to teach both a regular recall along with an emergency recall because I know that there might be a situation where a dog will be much too distracted and not motivated enough to respond to their normal recall word, such as if they've taken off after a squirrel. Their brain becomes hyper focused on chasing prey that they might not even hear the word "come." But because of how we've conditioned the emergency recall cue, it cuts through all that squirrel-static in a dog's brain. We never fade out the use of the high-value rewards and we do not use a marker word or clicker when training this cue. The reward for an emergency recall is MUCH more valuable to your dog than any other reward they receive for other behaviors — we also use it as a "jackpot" reward. What's a jackpot? This means you give multiple treats in a row, piece by piece. This is much more valuable to a dog than offering the same amount of treats all at once. Once fully trained, we do not use the emergency recall unless it is truly an emergency or we are prepared with the highest value "jackpot" reward. High Value Treats: Use a treat that your dog considers the highest value. I recommend using liverwurst, cooked fish/fish skin, or tripe. Another good option is freeze-dried raw dog treats, like this lamb liver from Pro-Treat. The treat for the emergency recall should not be a regular training treat (and even better than most "high-value" dog training treats), but something they will only get when training this cue. Do not use this reward for anything other than when you are practicing the emergency recall. A dog is never too young or too old to learn this behavior, so start today! You can move around while you charge (reinforce) your dog's cue, but you don't want your dog wandering too far away just yet. We are building a strong foundation of: "Kookooey!" = the best thing ever for your dog! Just as in clicker training, where the clicker is charged to predict a treat, this word becomes a predictor for the highest value reward. Start with your dog close to you and call out your emergency recall cue “Kookooey!”. Immediately give your dog 30 seconds of jackpot reward. This means small bites of that highest value treat, one right after another. Pair this treating with over-the-top excitement and verbal praise. Then give your release cue — “All done” or “Okay”. Wait about thirty seconds to a minute, then repeat. Practice this 5 times a day for a week, or until your dog shows immediate response and anticipation at the word before moving on to step 2. If your dog doesn't respond, go back to step one and consider whether your dog has a strong association built, if you are too far away, or if there are too many distractions. Mix up which side of the dog you are on when you give the cue; start in front, then move to one side, then give the cue when you're behind your dog. This will help your dog respond to the cue no matter where you are in relation to them. As you add distance to this cue, keep distractions as low as possible at first. Practicing in your home on a quiet afternoon or evening and calling from a different room is a good way to practice distance for this cue. Once your dog has connected the word "Kookooey" to predicting an amazing reward, you want to start to add some distance before you give your dog the cue. Start just a short distance away, about 6 feet. Say your verbal cue for the emergency recall. If you’ve been consistent in charging the cue, when they hear the word they should run over to you for their 30 seconds of reward! Release them with their release cue, let them wander away and lose a bit of focus, then repeat. Slowly work on adding more and more distance to the emergency recall. Don’t work too far away too quickly, as this is setting up the cue for failure. Start with about 6 feet (or the length of a leash), then add a few feet the next training session. After getting your dog conditioned to the recall word and working on adding distance, you can start to practice around distractions. Start with low-level distractions and make sure that you’re using the highest value reward, treating and praising for a continuous 30 seconds each time. Don’t go to the off-leash dog park and wait until your dog is mid-playtime to practice this cue at first – that’s not setting your dog up for success. 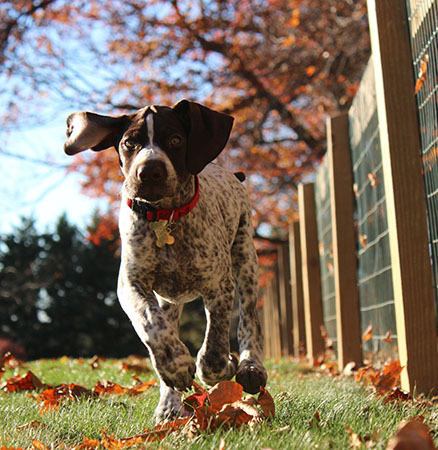 Start in a fully fenced yard, where your dog is off leash but has some distractions with different smells and noises, or use a long lead and practice in a small park or field. If you live near a busy road, attach your dog to their long lead for safety and control, and practice in front of your home to build a strong response in the real-life context. Practice while out on walks when your dog is engrossed in a smell, then give the cue and reward. Your tone: When you're practicing this cue, try to keep your tone of voice happy and your volume should be rather loud. Think about when you'll be using this cue in an emergency — you'll be a bit panicked as your dog takes off away from you, and if you've only ever practiced in a soft or quiet voice, your dog might not even hear you! A happy tone encourages your dog to come back to you for fun and rewards, and can help keep you calm in an emergency situation. Now that you've worked on adding distance and distraction to your dog's emergency recall, you'll want to maintain the value of the word. You do not need to practice this cue as often as you did while first introducing it, but keep the power of that emergency word by randomly practicing it one or two times a week. You always need to have your high value reward ready for when you ask your dog for their emergency recall. I like to prepare my dog's emergency recall reward the night before I plan on practicing it, and then I can easily pull it out of the refrigerator the next day. Do not overuse this cue! It is meant to be used in emergency situations only, and the word needs to retain its powerful charge for it to be reliable. If you do use it in an emergency where your dog does not receive the jackpot food reward, you do want to still reward with lots of high-energy praise and petting. Make sure your dog knows how amazing they are for running back to you when they heard their cue! Then spend the next couple of days re-charging your emergency recall cue, working through steps 1 through 3 as needed to make sure your dog still has a strong response and association to their word. While you work on teaching your dog the emergency recall, you might need to get your dog to come back to you in a high-stress situation, if they door dash or you accidentally drop their leash while out on a walk. There are a few things you can try to entice them to come back towards you. Make a distinctive noise! Dogs are attracted to novel things, so if you make a lot of commotion and act super excited, they will want to come check you out to see what all the fuss is about. Run the other direction or at an angle towards your dog. Many dogs love to play chase, so getting their attention with a noise and then running away from them might encourage them to chase you. Do not run straight towards your dog – they then become the thing you’re chasing and can turn this into a game of “catch me if you can.” Or if your dog is frightened, having someone running straight at them can be very scary and make them continue running away (towards danger). Fall down and do the “Dying Fly,” legs and arms straight up and moving around. This will be hard for your dog to ignore, since you’re down on their level and they’ll want to come see if you’re okay and what the big deal is. Pretend you’ve found something and make a big deal about it! Pretend there's food on the ground and act like you're eating it. Your dog will want to come investigate if they think you’ve found something that they should involved in too. Let us know if you have any training questions in the comments below, and share your stories of when you've had to use your dog's emergency recall in real life!